CJ and I survived a semester of chemistry with a professor who wore exceedingly tight jeans, chuckled our way through conversational Spanish and even spent a few months under the same roof at my parents house. He is my high school pal turned grown-up friend. And he’s one in a million. I know this card is not of the traditional birthday variety, but its sentiments reign true my friend. 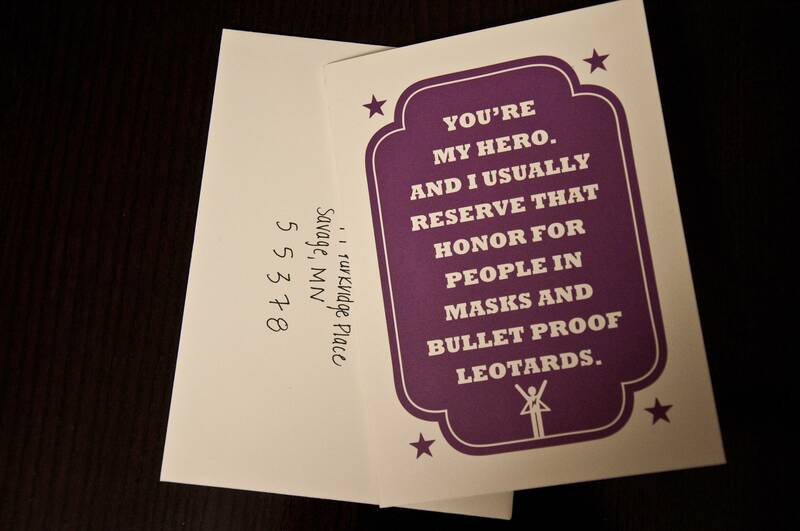 You are my hero (and thanks to your recent gym regimen I think you’d look pretty darn great in a bulletproof leotard). You’ve succeeded beyond measure and have so many accomplishments to your name. A quick wit and a completely infectious laugh always keep me smiling. And that heart of yours inspires me to be a better person. I have so many fond memories of our adolescence: passing notes in class, tormenting our Spanish teacher and having heartfelt chats in my driveway in your little red Mazda. Remember when you gave me the courage to tell my crush just how much I adored him? And when you helped me master acute and obtuse angles in geometry? I love that ten years later, we’re still friends. And now there are new memories. You were my first New York visitor by way of Florida and when we do get each other on the phone for a proper chat it is as if no time has gone by. I hope to know you for fifty more my friend. Happiest of Birthdays! Here’s to you and a great year ahead (and perhaps a summer Minnesota visit).